The instant New York Times bestseller Tiny Changes, Remarkable Results No matter your goals, Atomic Habits offers a proven framework for improving--every day. James Clear, one of the world's leading experts on habit formation, reveals practical strategies that will teach you exactly how to form good habits, break bad ones, and master the tiny behaviors that lead to remarkable results.If you're having trouble changing your habits, the problem isn't you. The problem is your system. Bad habits repeat themselves again and again not because you don't want to change, but because you have the wrong system for change. You do not rise to the level of your goals. You fall to the level of your systems. Here, you'll get a proven system that can take you to new heights.Clear is known for his ability to distill complex topics into simple behaviors that can be easily applied to daily life and work. Here, he draws on the most proven ideas from biology, psychology, and neuroscience to create an easy-to-understand guide for making good habits inevitable and bad habits impossible. Along the way, readers will be inspired and entertained with true stories from Olympic gold medalists, award-winning artists, business leaders, life-saving physicians, and star comedians who have used the science of small habits to master their craft and vault to the top of their field.Learn how to: * make time for new habits (even when life gets crazy); * overcome a lack of motivation and willpower; * design your environment to make success easier; * get back on track when you fall off course;...and much more.Atomic Habits will reshape the way you think about progress and success, and give you the tools and strategies you need to transform your habits--whether you are a team looking to win a championship, an organization hoping to redefine an industry, or simply an individual who wishes to quit smoking, lose weight, reduce stress, or achieve any other goal. This book does a great job of laying down the framework of how habits are formed, and shares insightful strategies for building good habits and breaking bad ones. Even though I was already familiar with research behind habit formation, reading through this book helped me approach habits I’m trying to adopt or break in my own life from different angles.But the book suffers from the same problems that seem to plague all self-help books. In the chapter about tracking habits, the author shares an an This book does a great job of laying down the framework of how habits are formed, and shares insightful strategies for building good habits and breaking bad ones. Even though I was already familiar with research behind habit formation, reading through this book helped me approach habits I’m trying to adopt or break in my own life from different angles.But the book suffers from the same problems that seem to plague all self-help books. In the chapter about tracking habits, the author shares an anecdote about Benjamin Franklin’s habit of carrying a journal everywhere to track thirteen virtues. If you care to know more about that story, Franklin tried to make a habit of his thirteen virtues by turning it into a thirteen week course where he would work on a different virtue every week and track his progress. The author conveniently leaves out the fact that Franklin quickly found this method impractical and abandoned the project before getting through all thirteen virtues. There’s a lot of irony in including this anecdote in a chapter that talks about the importance of not “breaking the chain”. So while the author isn’t entirely wrong, I found it off-putting that he would retell this story in a manner that fit his narrative. This is a vice that is found all too commonly in self-help and pop science books that make you question the author’s intellectual rigour.Another criticism I have of this book is that it could have been even shorter. The last few chapters under “Advanced Tactics” that deal with the topic of mastery were the weakest in the book. While there is an obvious connection between habits and mastery, trying to tie in a topic as complex as mastery was perhaps too ambitious.The three star rating I am giving this book doesn’t reflect how important I consider habits to be. I completely agree with the author that habits are the cornerstone of your life. If you want to change your life in any meaningful way, the only dependable way I know is to build good habits. If you need convincing that habits are important, I would strongly recommend this book. If you are already convinced but struggling to adopt or break habits, racing through this book will give you some good ideas about how you can make changes stick. I received this book as a Goodreads giveaway yesterday and immediately settled down to read it. I am always very skeptical of self help books because they often do no get to the root of issues. This one did. James Clear's main arguments are that habits are the compound interest of self improvement and that your identify emerges out of your habits. So, you must expereince a shift in identity for your habits to hold. This made a lot of sense to me, but I do think that Clear should have addresses d I received this book as a Goodreads giveaway yesterday and immediately settled down to read it. I am always very skeptical of self help books because they often do no get to the root of issues. This one did. James Clear's main arguments are that habits are the compound interest of self improvement and that your identify emerges out of your habits. So, you must expereince a shift in identity for your habits to hold. This made a lot of sense to me, but I do think that Clear should have addresses deeper emotional issues and gave readers resources so as not to mislead them into believing that they can change their identity by action (repeating new habits) alone. My 2019 girl boss recommendation. 💕“Habits do not restrict freedom. They create it. Building habits in the present allows you to do more of what you want in the future.”This book has helped me build a more productive morning routine and I love it! ☀ Being a morning person has always been a struggle for me, but this book gives you very clear and very easy steps to create the life you’ve always imagined. When going through your daily habits, ask yourself, “Does this habit cast a vote for or agains My 2019 girl boss recommendation. 💕“Habits do not restrict freedom. They create it. Building habits in the present allows you to do more of what you want in the future.”This book has helped me build a more productive morning routine and I love it! ☀️ Being a morning person has always been a struggle for me, but this book gives you very clear and very easy steps to create the life you’ve always imagined. When going through your daily habits, ask yourself, “Does this habit cast a vote for or against my desired identity?” Being more mindful about your day to day activities will open up so many doors. This is truly such a life changing book! This is a dual review of two books about habit. Habits are important things in one’s life and there are numerous books on the subject. The classic book, a must read, is The 7 Habits of Highly Effective People by Stephen R. Covey. Another two popular books about habits are The Power of Habit by Charles Duhigg and Atomic Habits by James Clear, that came out very recently. Having read all three of them I combined my notes for the last two in this post. No matter what stage in life you are, it is al This is a dual review of two books about habit. Habits are important things in one’s life and there are numerous books on the subject. The classic book, a must read, is The 7 Habits of Highly Effective People by Stephen R. Covey. Another two popular books about habits are The Power of Habit by Charles Duhigg and Atomic Habits by James Clear, that came out very recently. Having read all three of them I combined my notes for the last two in this post. No matter what stage in life you are, it is always good to review one’s habits and behaviour – these books provide a good framework for doing it.One of the habits I’m struggling with is to get rid of the reading of self-help books. Thus, reading The Power of Habit by Charles Duhigg and parallelly Atomic Habits by James Clear became a sort of a meta enterprise. Would these self-help books about habits help me to get rid of the habit of reading self-help books? There’s nothing wrong with the self-help genre per se. I believe, everybody should strive to become a better version of themselves. Evidently, there’s a lot of great wisdom in this type of books – many prominent figured refer to them when they tell the story of their success. However, having read tons of them, one would usually circle around the same known stuff and shabby ideas wrapped in different narratives and supported by different anecdotes. The trick here is to know when to stop and, actually, go out and do something by using the knowledge and inspiration gained.My own habit of falling back to self-help books is, obviously, grounded in the alluring products of the habit loop driven by the craving for knowledge on self-improvement. We can use the basic members of the habit loop – cue, routine, and reward – well covered in the Duhigg’s book and analyse the situation with the reading of self-help books. For this type of products, the cues (triggers) are everywhere, and who can ignore the wish for excellence? Then, the routine is easily carried out – the messages in those books are straightforward that doesn’t require a very deep thinking and reading between the lines. It just assumes the acceptance in many cases, and, finally, the reward is instant – the feeling of getting something very valuable – a digested wisdom and not seldom a bit of inspiration. It can be compared to junk food (which by the way is almost gone from my life thanks to this kind of books). However, my point is not to pick on this genre, but rather to stress the importance of not getting stuck in it, as in my previous point. Habit as a phenomena humans and other living creatures are equipped with is one of my favourite subjects. I strongly believe, in the end, habits defines us and our destiny. The subject of habit covers several interesting areas as neuroscience, biology, psychology, and more. The basic mechanics of habit system can be described through the theory of operand conditioning, a term coined by B.F. Skinner back in 1930. It is a technique of learning that occurs through reward and punishment for behaviour. Through operand conditioning, an individual makes an association between a behaviour and a consequence. A relatively simple feedback loop forming habits of an individual can be described in terms of drive, stimulus, response, reward with different kind of reinforcers – positive or negative. What was lacking in the model of operand conditioning was other influencers like feelings, thoughts, and, very importantly – beliefs. Moreover, human behaviour is so complex that factors as the environment and group psychology are of crucial importance when it comes to the habit science. Modern behavioural science takes these terms into account and they are very important in the habit theory. The authors of both books did a great job addressing these factors in their respective methodologies.Based on the early theory of operand conditioning, different models around habits and behaviour (in my interpretation, behaviour is a series of actions evoked by habits) are developed and fundamental terms are just called different names. Charles Duhigg in The Power of Habit grounds his model on the habit loop consisting of cue-routine-reward parameters which are driven by craving. James Clear in Atomic Habits suggests his model consisting of four steps called cue, craving, response, and reward. These factors are systematically analysed by respective author and the steps how to build good habits and remove the bad ones based on these models are suggested. In both books I found some valuable and interesting points as well as good tips on how to keep one’s habits on the right track.As one can see from the parameters in each model, there’s a difference in the arrangement of them making some differences in application of the methodologies of habit treatment. Duhigg sees the term craving as a driving force for the members in the habit loop – cue, routine, reward. Clear suggests that craving is simply a second stage in his model of habit. This is the main difference, and I need to admit I haven’t put enough time to analyse which model is right – both make sense. We would need some deeper diving in relevant disciplines and get help from ontology of the actual things here. Anyhow, I tend to believe that a craving lies above cue, routine, and reward. Cues alone without craving are meaningless. Nevertheless, both models are very useful for working on one’s habits. Duhigg argues that the way of changing or replacing of habit is to focus on the routine parameter, or the response part according to the terminology or Clear. Clear gives a lot of examples on how the cue and reward steps can be worked on. I completely agree that even these parts can be influenced, whereas Duhigg argues that the most important thing is to focus on routine leaving cues and rewards unchanged. I believe, we can remove unwanted triggers. Like making the tempting things like candies hard to reach and out of sight, etc. This has been well researched in a very interesting work by Richard H. Thaler for which he was awarded the Prize in Economic Sciences in Memory of Alfred Nobel 2017. Then, we can reprogram our brain to think about rewards differently – change the mode of them or reinforce the distant rewards requiring immediate sacrifice by some direct reward. Clear has a lot of good examples how to do it.Habit should be seen as one of the essential parts forming an individual. A brilliant quote by Margaret Thatcher shows the operational importance of habits: “Watch your thoughts, for they will become actions. Watch your actions, for they'll become... habits. Watch your habits for they will forge your character. Watch your character, for it will make your destiny.” If we put those terms it in a different order, we can see that habits are very important, perhaps more important than one’s thoughts, because they are operational tools defining which actions one will take and what destiny those actions will form.In summary, if you are somehow unsatisfied with any of your habits and would like to actively and effectively change them and thus become an individual you’d like to be, I strongly recommend both books. I would read The Power of Habit book first, this book is longer, has more stories, and has more research behind it. 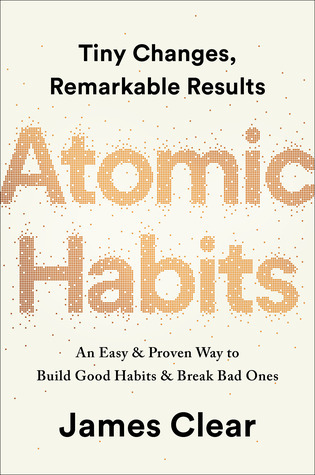 Atomic Habits book is easier to get through, especially after reading Duhigg’s book. Both books, as you might have guessed, are clear, easy to read and grasp. They will give you the right mindset to approach your behaviour and provide valuable tools to shape your personality. This is basically reinforcement for Duhigg's books on habits. There is some good advice--get rid of obstacles, use cues of things you like to do with things you need to do (i.e., everytime you check facebook, do pushups or whatever). It's good advice, but nothing new or unique. 8/10Atomic Habits is a useful book. It’s a practical guide to identifying and changing your habits. It’s something you can actually put into practice in your life. I think that all of the concepts in the book are good and useful to know but some of the action points I think are slightly oversimplified. If you take the action points in some chapters and modify them to your specific situation you can still apply most of them but you do have to do some critical thinking with the material. I like th 8/10Atomic Habits is a useful book. It’s a practical guide to identifying and changing your habits. It’s something you can actually put into practice in your life. I think that all of the concepts in the book are good and useful to know but some of the action points I think are slightly oversimplified. If you take the action points in some chapters and modify them to your specific situation you can still apply most of them but you do have to do some critical thinking with the material. I like that the book is simple and straightforward. James Clear doesn’t bog you down with a lot of conceptual material. He starts each chapter with an example (some are better than others), gives you the concept plainly, and then gives you concrete actions to apply the concept in real life. It’s a nice formula. Each chapter is roughly 15-20min.This book is worth reading. It’s easy to apply the knowledge and action steps. Even if it doesn’t completely change your behavior, it will make you more aware of yourself. It provides a good lens that you can use to view yourself and others. I would recommend it to anyone who is trying to really set an airtight routine. If you follow the book you can definitely make something a habit. I’m a fan of James Clear. I have read his newsletter for about 2yrs now. His newsletter is one of the best I’ve read because it’s interesting and well researched and always has some take away for me. His book is really an expansion on a lot of things he’s covered in his newsletter. There are some chapters that I was already very familiar with because I had read his previous material on it. This doesn’t detract from the book. He expands on most things he’s written about before. The book is laid out like a road map and builds upon itself, which is something you don’t really get from the newsletter. The intro is pretty graphic. It’s about a personal injury the author has faced. I recommend being prepared for that. Once you get through that it’s all good. I was enlightened by "Willpower" and got some great takeaways from "The Power of Habit", but this is next-level in terms of practical steps and also generating pivotal mental shifts both for the immediate and long terms. Important note: it gets better with each successive chapter - something critical to know since the opening is understandably crucial to the author, but not so much to many readers. Read it. TLDR; - "You do not rise to the level of your goals. You fall to the level of your systems. "- The best way of building a habit is making it part of your identity.- Make it easy to start: Habits are the entry point - not the goal. "Read 30 books" ⇒ "Read before bed every night" ⇒ "Read one page". Reduce a habit into a 2-minute first step.- Stick to the plan: "Professionals stick to the schedule, amateurs let life get in the way." Don't be a "fair weather runner" if you want to run a lot.- Make it TLDR; - "You do not rise to the level of your goals. You fall to the level of your systems. "- The best way of building a habit is making it part of your identity.- Make it easy to start: Habits are the entry point - not the goal. "Read 30 books" ⇒ "Read before bed every night" ⇒ "Read one page". Reduce a habit into a 2-minute first step.- Stick to the plan: "Professionals stick to the schedule, amateurs let life get in the way." Don't be a "fair weather runner" if you want to run a lot.- Make it hard to do the things you want to avoid.Most modern "American self-help books for engineers or entrepreneurs" (it is a category for me) are too repetitive and too long. Atomic Habits is not! It does have the category-required set of stories of American (mostly men) who built a great habit and got to the top - but just the right amount. ----- NOTES -----*Identity*The three levels of change - the lower the more "fundamental":3. Outcomes = Your goals 2. Processes = Your system1. Identity = Who you perceive yourself to beMake every action is a vote for what kind of person you want to become. Building habits is becoming the version of yourself you want to be. Habits help you to trust yourself. - Realize that "You don't _have to_ do anything, you _get to_." - Ask "What would a healthy person do?". - Ask "What feel like fun to you, but is work to others? "*Engineer it so that:*Things you want to achieve vs Things you want to avoidObvious —————————————— InvisibleAttractive ————————————UnattractiveEasy ————————————————— HardSatisfying ————————————- SatisfyingFor example: if you want to watch less TV - keep it unplugged - only plugin if you can say out loud the name of the show you want to watch. I would recommend this to fans of the Power of Habit, it was easy to read and quite interesting but nothing life changing. In an episode of the North Star Podcast with David Perrell, the software entrepreneur Daniel Gross said something that I thought was very wise:The definition of a habit, for me, is something that doesn’t require willpower. How can I build a large collection of habits that are healthy—that are correct—and save them to RAM in my head so that I don’t have to think about them? I would like to have that done by the end of my 20s. I’d like to be in a good place in terms of body composition, in terms o In an episode of the North Star Podcast with David Perrell, the software entrepreneur Daniel Gross said something that I thought was very wise:The definition of a habit, for me, is something that doesn’t require willpower. How can I build a large collection of habits that are healthy—that are correct—and save them to RAM in my head so that I don’t have to think about them? I would like to have that done by the end of my 20s. I’d like to be in a good place in terms of body composition, in terms of what I eat, in terms of how I work, so that I can spend the rest of my life not thinking about that stuff.I heard this a few weeks before the New Year, and I got to thinking about which habits I might want to build or break in 2019. I found the perfect companion to this reflection in James Clear’s new book, Atomic Habits: An Easy and Proven Way to Break Bad Habits & Build Good Ones.The motivating idea behind the book is that habits are the compound interest of behaviour. Get 1% better each day and you will rarely notice a change on any given day, but by the end of a year you will be 38% better than when you started (1.01^365 = 37.8). It’s often not possible or useful to try to quantify your skill level—maybe you just want to remember to floss—but the insight is that huge long-term differences can be born from barely perceptible but consistent short-term differences. Hence, atomic habits: pennies that grow into a fortune.Clear explains that all habits, good or bad, play out in four stages:- The cue. You perceive a specific signal. You see cookies on the kitchen table.- The craving. You feel a rush of desire for a specific reward. Your mouth starts watering as you imagine the chocolate chips melting in your mouth.- The response. You perform an action. You pick up a cookie and bite into it.- The reward. You experience pleasure as your desire is satisfied. Your taste buds send gushing thank-you notes up to your brain.Each stage of this cycle is a lever you can pull to influence your behaviour. To build a good habit, pull them one way; to break a bad one, pull them the other way. This is the essence of Clear’s method.To build a good habit:- Make it obvious (the cue)- Make it attractive (the craving)- Make it easy (the response)- Make it satisfying (the reward)To break a bad habit:- Make it invisible (the cue)- Make it unattractive (the craving)- Make it hard (the response)- Make it unsatisfying (the reward)The book is broken into four sections, one for each stage of the habit cycle. Each chapter begins with a short vignette about a historical figure, and then dives into a related piece of advice. If you’ve done some thinking or reading about habit formation before, then you might be familiar with many of these ideas already. This was the case for me. However, even if you feel like you know the landscape well, I think you would find at least one actionable idea in the book. For the rest of this post, I’ll describe the ideas that I’ve implemented myself since reading it.Habit stackingOne of the easiest ways to build a new habit is to attach it to an existing one. By resolving to start performing a new habit directly following another one that is already ingrained, you turn the old habit’s reward into the new habit’s cue; you make it obvious. After enough repetitions, the new habit is woven into your life.Last year, I developed a stable habit of doing push-ups and kettlebell swings after every 25-minute work block throughout my workday. When I read about habit stacking, I recognized an opportunity to use these existing habits as foundations for a new one: drinking more water. Now, every time I do my push-ups and kettlebell swings, I drink a small glass of water. I’m more hydrated than ever.Implementation intentionsIn a study, two groups were asked to make to-do lists, but one group was given a small tweak that resulted in them accomplishing many more tasks than the other. They were told to write down with each task the time and location where they intended to complete it. They created an implementation intention. This is another way to make a behaviour more obvious, this time by associating the action with a context that can be perceived as the cue.I’ve started writing down implementation intentions every time I add an item to my to-do list. Instead of Call the bank to order a new debit card, it’s Call the bank to order a new debit card in the living room on Saturday morning. While there are still plenty of overdue tasks on my to-do list, this new habit of writing down where and when I intend to complete each task has helped me cross a number of them off.Prime your environmentI first learned the value of this lesson three years ago when I lived in a tiny coach house in Welland, Ontario. I had always struggled to get out of bed on time, but I was teaching courses of my own for the first time and couldn’t afford to be late for class. So I came up with a solution. Each night before bed, I prepared my stovetop espresso maker and put it on the stove, alongside a clean mug and my phone (my alarm). When my alarm started ringing, I had to get out of bed and walk over to the stove to turn it off. Immediately, I would turn on the stove element and go back to bed for a snooze. Ten minutes later I would be woken again by the gurgling of the espresso, as well as the fear that it would boil over if I didn’t get up to turn off the element. My reward for getting up the second time was a fresh cup of coffee. Ever since then I’ve been completely cured of my snoozing habit.As Clear explains, priming your environment for its next use is a great way to make a desirable behaviour more obvious as well as easier. After reflecting on this, I’ve been experimenting with a few changes:- Pumping up my bike tires as soon as I get home from my evening bike commute. (This makes it easier to choose the bike as my mode of transport the next day. )- Repacking my gym bag as soon as I get home from the gym. (This makes it easier to go for a work-out whenever I feel like it. )- Filling up a big water jug next to my desk at the end of each work day. (This makes it easier to stay hydrated the next day. Note that putting the water jug there also makes my drinking habit more obvious. )- Placing a novel on my pillow after making my bed each morning. (I’m trying to build the habit of reading fiction before bed because I find that it helps me sleep. )Make it smallI’ve used various habit trackers for about four years now, and I’ve just about settled on TaskLife as my favourite. I define a list of behaviours, and each day the app asks me whether I’ve done them. The beauty of it is that I can choose the frequency with which I want to perform each task, as well as the time period over which to calculate that frequency. It’s like Andy Matuschak’s system of smoothly ratcheting targets with teeth, minus a bit of smoothness and all the teeth.The most common reason that I’ve failed to hit my target frequency has been the size of my tasks—they have been too hard. For example, it’s often hard to find the time and motivation for one full hour of writing, so I would often skip that habit. Even before reading Atomic Habits, I had recognized this problem and made some changes, like cutting 60 minutes of writing down to 10. But Clear offered many more ways to break down a complex or challenging behaviour into a task that can be completed in under two minutes. Since getting started is by far the hardest part of most habits, I decided to change all my habits in TaskLife to 2-minutes-or-under tasks as a way of making it easier to spend time on the things that matter to me. Here is the current list of questions that TaskLife asks me each morning about my previous day, along with the frequency with which I aim to complete those tasks over a rolling window of 21 days:- Did you study at least one flashcard? (70%)- Did you read at least one page of fiction? (70%)- Did you write at least one sentence? (55%)- Did you read at least one Pocket article? (50%)- Did you play at least one chord on the guitar? (50%)- Did you write at least one sentence in your journal? (50%)- Did you go to bed by 9:30pm? (50%)- Did you send at least one message to a friend? (50%)- Did you read at least one page of nonfiction? (40%)- Did you walk through the doors of the gym? (25%)Automate itLastly, the easiest way to make a task easier is to delegate it to a machine. As a data scientist, I have obviously implemented this one before, too. I’ve automated my health insurance payments, my donations to charity, my bus pass top-ups, my memorization efforts, my sleep tracking, my exercise tracking, and my rebalancing calculations in my investment accounts. But there are always more things to automate, and Clear’s chapter on the subject got me to reflect on what else I could do. Since reading the chapter, I’ve set up automatic payments on all of my regular bills, and on my to-do list (with an implementation intention!) is the task of setting up automatic monthly transfers into my investment accounts.In summary, I highly recommend Atomic Habits. If the topic of habit formation is new to you, I think this book is probably the best general resource you’ll find. And if the topic is already familiar, you’ll find that the book is a quick and engaging read with dozens of fresh ideas that you can consider implementing in your life. This is THE book for habit building and tracking. James Clear provides clear insights on various aspects regarding habits and the four laws are simple and easy to remember. Definitely recommend! After watching an interview with James Clear, I had to read this book. In only 200 pages he explains everything you need to know in order to work on your habits. Plus, I also got the feeling that he is a nice and fun person in general. A life changing book. I was lucky to get an advanced copy. James gives great advice on how to build good habits and how to break bad ones. He gives very interesting real life examples and charts that explain his points in an entertaining way. Each chapter has a summary and there is an overall summary of the key principles (laws). I highly recommend this book. Very helpfulThis book is very helpful. Lots of great tips. I hope I can put them to good use. Seems simple enough. I really liked this book. It is very practical and interesting. It did remind me a little bit of The Power of Habit: Why We Do What We Do in Life and Business by Charles Duhigg. It included a lot less of the story telling, but included much of the advice of changing habits. It also reminded me of The Happiness Advantage: The Seven Principles of Positive Psychology That Fuel Success and Performance at Work by Shawn Achor. A really great book, that mentions adding friction to make it harder to go I really liked this book. It is very practical and interesting. It did remind me a little bit of The Power of Habit: Why We Do What We Do in Life and Business by Charles Duhigg. It included a lot less of the story telling, but included much of the advice of changing habits. It also reminded me of The Happiness Advantage: The Seven Principles of Positive Psychology That Fuel Success and Performance at Work by Shawn Achor. A really great book, that mentions adding friction to make it harder to go with bad habits (remove the remote control batteries, and it will probably make you think more about turning on the tv). The author suggests that you should decide who is the person you want to be, and that habits make you who you are. Your habits shape your identity, and you can change your habits and identity (not sure that I am super happy with that phrasing, but there was much in the book that was really good, so I'll be willing to look away on this phrasing :)). I really loved his system: How to Create a Good HabitThe 1st law (Cue): Make it obvious.The 2nd law (Craving): Make it attractive.The 3rd law (Response): Make it easy.The 4th law (Reward): Make it satisfying.And:How to Break a Bad HabitInversion of the 1st law (Cue): Make it invisible.Inversion of the 2nd law (Craving): Make it unattractive.Inversion of the 3rd law (Response): Make it difficult.Inversion of the 4th law (Reward): Make it unsatisfying.It is worth mentioning that James Clear had a really terrible accident in baseball, and a serious head injury. He had been hit in the face with a baseball bat, and got into a comma. But this injury probably had a part of who he is today. This injury was one of mine, and the experience taught me a critical lesson: changes that seem small and unimportant at first will compound into remarkable results if you’re willing to stick with them for years. We all deal with setbacks but in the long run, the quality of our lives often depends on the quality of our habits. With the same habits, you’ll end up with the same results. But with better habits, anything is possible. His parents were no strangers to the hospital, since his sister had cancer a decade earlier. Oh my, poor parents.Clear puts an emphasis on starting, even with a little tiny easy thing. Habits for the most part is doing something that you started, whether it is sitting on the sofa, or going to the gym. Habits are like the entrance ramp to a highway. They lead you down a path and, before you know it, you’re speeding toward the next behavior. It seems to be easier to continue what you are already doing than to start doing something different. He gives the example of running starting with tying your running shoes.I really liked this book. Practical and nicely written, with some great advice. 4 stars. Great book. Well researched, simple, straight forward (for the most part).I would recommend this book to any who look at the title and think "I could use that" because it lives up to its title. If you struggle with building or breaking habits, this book will offer useful insight on how to do that, or at least help you understand why it is that way. In case you are already familiar with the research behind the study, you could still benefit from seeing how that study can be put into action.I thin Great book. Well researched, simple, straight forward (for the most part).I would recommend this book to any who look at the title and think "I could use that" because it lives up to its title. If you struggle with building or breaking habits, this book will offer useful insight on how to do that, or at least help you understand why it is that way. In case you are already familiar with the research behind the study, you could still benefit from seeing how that study can be put into action.I think the magic of this book lies in how close to home it hits, James Clear knows his stuff.The downside is that at a certain point things start to get blurry, while most of the book is well organized and clear, could be just a personal experience of mine. Besides that, some points which clearly need more in-depth discussion are not given enough light. It depends whether that was the best option, to not complicate things. All in all, definitely worthwhile, I learned much of this book. Maybe the trajectory of my life just shifted. Great book containing ideas that we are all aware of but need to hear and act upon. The author tells interesting and relevant stories while mixing in some research on the topic. There are occasional unusual tips and tricks for habit formation and continuity. The system is quite rigid and similar to the one found in "The Power of Habit". I was not particularly happy about the constant links to his website but that might have been due to the Audiobook version I was using. Strong recommendation for Great book containing ideas that we are all aware of but need to hear and act upon. The author tells interesting and relevant stories while mixing in some research on the topic. There are occasional unusual tips and tricks for habit formation and continuity. The system is quite rigid and similar to the one found in "The Power of Habit". I was not particularly happy about the constant links to his website but that might have been due to the Audiobook version I was using. Strong recommendation for anyone! I’ve just gotten the time to write about this lovely lovely book. I’ll preface this by saying that I am a productivity junkie. Like a complete nerd. I have 2 habit tracking apps. 2 planners: one is a journal/to-do list planner and one is a ginormous calendar. I watch productivity videos 24/7 too, my favourite YouTubers include Thomas Frank, Matt D’Avella, Michelle B, Med School Insiders, Ali Abdaal etc. I watch Tedx videos like an addict. Suffice to say, I’m obsessed with habit-formation and sel I’ve just gotten the time to write about this lovely lovely book. I’ll preface this by saying that I am a productivity junkie. Like a complete nerd. I have 2 habit tracking apps. 2 planners: one is a journal/to-do list planner and one is a ginormous calendar. I watch productivity videos 24/7 too, my favourite YouTubers include Thomas Frank, Matt D’Avella, Michelle B, Med School Insiders, Ali Abdaal etc. I watch Tedx videos like an addict. Suffice to say, I’m obsessed with habit-formation and self-improvement. And yet, James Clear taught me so so many things with this book. I am so glad I decided to pick this one up. It completely revolutionized my understanding of self-improvement. Right before “Atomic Habits” I read “The Power of Habit” by Charles Duhigg which I am sure had great impact on Clear’s work. Right after Atomic Habits, I read “You are a Badass” by Jen Sincero. Neither of these works are even CLOSE to being as precise, informative, and helpful as Clear’s book. I am sure I will cherish my copy for years to come — it is already furiously highlighted. I’ll have to read again with a pencil in hand. I won’t shut up about this book, I’ll tell it to anyone who will listen. I learned so much about how to break bad habits, how to build new ones, how to change my environment, and more. I can’t wait to implement all of these in my journey of self-improvement and goal-setting.6/5 stars really!! 4.5*I found this book to be extremely helpful, even on the first day that I started reading it. I immediately changed the way I think about myself (organized and productive vs. unorganized and lazy) and created a plan to change my morning habits. It was much easier to do than I imagined. Mostly, I think it is because I wanted the change. I don't think there are any ideas in this book that I've never considered or didn't try BUT it was the presentation of ideas and the explanation of why we act t 4.5*I found this book to be extremely helpful, even on the first day that I started reading it. I immediately changed the way I think about myself (organized and productive vs. unorganized and lazy) and created a plan to change my morning habits. It was much easier to do than I imagined. Mostly, I think it is because I wanted the change. I don't think there are any ideas in this book that I've never considered or didn't try BUT it was the presentation of ideas and the explanation of why we act the way we do (e.g., the cues and rewards) that were most helpful. The specific bad habits that I can relate to (most importantly) include time spent on social media and watching TV (even just having it on in the background). I already have lots of good habits but I like the author's idea of habit stacking (building on those habits). I had not thought of it that way, even though I do it. I am more likely now to consciously (with a plan) habit-stack, to incorporate the good habits I want to form.The author has presented practical solutions to addressing different behaviors. Some are more draconian than I need but by telling myself I will resort to those measures, that alone is already changing my behavior. (E.g., I do not want to delete my GR app from my phone!) I've had 2 successful days at changing my morning routine and I feel really good! I have other areas to work on but, for me, that is the most important time of the day and a great start. Thank you James Clear for writing this book! I feel like it was the push that I needed. I don't know where I heard about this book but I requested my library to purchase it, which they did! So, I also thank the Albuquerque Library System for adding this book to their on-line collection. I won this in a Goodreads giveaway.Well written book on how to change your habits. If you are going to read one book on habits, this is it! I've read several books about building habits and I didn't expect there would be anything new here. Surprisingly, there were some new ideas and also a great recap of many of the concepts I've read before. James Clear understands that we are not one size fits all and gives us lots of different techniques to apply to build (or break) your own habits. He also interjects some personal stories and anecdotes to keep it interesting. Very easy and If you are going to read one book on habits, this is it! I've read several books about building habits and I didn't expect there would be anything new here. Surprisingly, there were some new ideas and also a great recap of many of the concepts I've read before. James Clear understands that we are not one size fits all and gives us lots of different techniques to apply to build (or break) your own habits. He also interjects some personal stories and anecdotes to keep it interesting. Very easy and fun to read! Atomic habits1% better every day for one year = 37,78 times better resultsDon’t think linear progress, think exponential and stick to itWhen you stick to the good habit there will be a definite time in the future of “explosive growth”Focus on the systems, design them well and they will take care of progressThree layers of behavior change: outcomes, processes, identity; focus on identity in two steps:1. Decide the type of person you want to be.2. Prove it to yourself with small wins.Identity = re Atomic habits1% better every day for one year = 37,78 times better resultsDon’t think linear progress, think exponential and stick to itWhen you stick to the good habit there will be a definite time in the future of “explosive growth”Focus on the systems, design them well and they will take care of progressThree layers of behavior change: outcomes, processes, identity; focus on identity in two steps:1. Decide the type of person you want to be.2. Prove it to yourself with small wins.Identity = repeated beingness.Habits = reliable solutions to recurring problems in our environment.Use the habits scorecard and observe yourself neutrally from the outside and then modify what you do every day.“Pointing and calling system”: point to what you are going to do, say it, and do it.Intention to implement:“When situation X arises, I will perform response Y”Make a specific plan:“I will (behavior) at (time) in (location)”Diderot effect/habit stacking:“After (current habit), I will (new habit)”For me: when the phone rings, I will take one deep breath and smile before answering.The 1st law of behavior change: make it obviousThe 2nd law of behavior change: make it attractiveTemptation bundling: pair an action you want to do with an action you need to do (making sales calls before you can look at Facebook).Habits are a dopamine-driven feedback loop. When dopamine rises, so does our motivation to act.Inversion of 2nd law: make a “bad” behavior unattractive.3rd law of behavior change: make it easy.It’s about reps and sets, until it’s automatic. Neurons that fire together, wire together. Repeat and this wiring gets stronger and stronger.Human behavior follows the law of least effort. We gravitate towards the option that requires the least amount of work.40-50% of our actions are done out of habit. Habits are automatic decisions and they influence strongly the following choices. So our habits constrain our available options in the future.Decisive moments during the day branch out in a tree of decision heading for the “good” or “bad” outcomes.2 minute rule: when you start a new habit it should take less than 2 minutes to do.